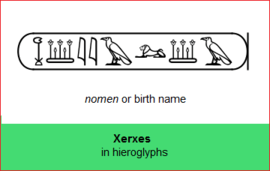 Xerxes I (/ˈzɜːrksiːz/; Old Persian: 𐎧𐏁𐎹𐎠𐎼𐏁𐎠 x-š-y-a-r-š-a ( Khashayarsha ) "ruling over heroes", Greek Ξέρξης [ksérksɛːs]; 518–465 BC), called Xerxes the Great, was the fourth king of kings of the Achaemenid dynasty of Persia. He ruled from 486 BC until his assassination in 465 BC at the hands of Artabanus, the commander of the royal bodyguard. Xerxes I is most likely the Persian king identified as Ahasuerus (Hebrew אֲחַשְׁוֵרוֹשׁ Hebrew pronunciation: [ˀaxaʃveroʃ]) in the biblical Book of Esther. He is also notable in Western history for his failed invasion of Greece in 480 BC. Like his predecessor Darius I, he ruled the empire at its territorial apex. His forces temporarily overran mainland Greece north of the Isthmus of Corinth  until the losses at Salamis and Plataea a year later reversed these gains and ended the second invasion decisively. Artobazan claimed the crown as the eldest of all the children, because it was an established custom all over the world for the eldest to have the pre-eminence; while Xerxes, on the other hand, urged that he was sprung from Atossa, the daughter of Cyrus, and that it was Cyrus who had won the Persians their freedom. Xerxes was also helped by a Spartan king in exile who was present in Persia at the time, Eurypontid king Demaratus, who argued that the eldest son does not universally mean they have claim to the crown, as Spartan law states that the first son born while the father is king is the heir to the kingship. Some modern scholars also view the unusual decision of Darius to give the throne to Xerxes to be a result of his consideration of the unique positions that Cyrus the Great and his daughter Atossa enjoyed. Artobazan was born to "Darius the subject", while Xerxes was the eldest son born in the purple after Darius's rise to the throne, and Artobazan's mother was a commoner while Xerxes's mother was the daughter of the founder of the empire. Almost immediately, Xerxes crushed revolts in Egypt and Babylon that had broken out the year before, and appointed his brother Achaemenes as satrap over Egypt. In 484 BC, he outraged the Babylonians by violently confiscating and melting down the golden statue of Bel (Marduk, Merodach), the hands of which the rightful king of Babylon had to clasp each New Year's Day. This sacrilege led the Babylonians to rebel in 484 BC and 482 BC, so that in contemporary Babylonian documents, Xerxes refused his father's title of King of Babylon, being named rather as King of Persia and Media, Great King, King of Kings (Shahanshah) and King of Nations (i.e., of the world). This comes from the Daiva Inscriptions of Xerxes, lines 6-13. Darius died while in the process of preparing a second army to invade the Greek mainland, leaving to his son the task of punishing the Athenians, Naxians, and Eretrians for their interference in the Ionian Revolt, the burning of Sardis, and their victory over the Persians at Marathon. From 483 BC, Xerxes prepared his expedition: The Xerxes Canal was dug through the isthmus of the peninsula of Mount Athos, provisions were stored in the stations on the road through Thrace, and two pontoon bridges later known as Xerxes' Pontoon Bridges were built across the Hellespont. Soldiers of many nationalities served in the armies of Xerxes from all over his multi-ethnic massive Eurasian-sized empire and beyond, including the Assyrians, Phoenicians, Babylonians, Egyptians, Jews, Macedonians, European Thracians, Paeonians, Achaean Greeks, Ionians, Aegean islanders, Aeolians, Greeks from Pontus, Colchians, and many more. According to the Greek historian Herodotus, Xerxes's first attempt to bridge the Hellespont ended in failure when a storm destroyed the flax and papyrus cables of the bridges. In retaliation, Xerxes ordered the Hellespont (the strait itself) whipped three hundred times, and had fetters thrown into the water. Xerxes's second attempt to bridge the Hellespont was successful. The Carthaginian invasion of Sicily deprived Greece of the support of the powerful monarchs of Syracuse and Agrigentum - ancient sources assume Xerxes was responsible, modern scholarship is skeptical. Many smaller Greek states, moreover, took the side of the Persians, especially Thessaly, Thebes and Argos. Xerxes was victorious during the initial battles. At the Battle of Thermopylae, a small force of Greek warriors led by King Leonidas of Sparta resisted the much larger Persian forces, but were ultimately defeated. According to Herodotus, the Persians broke the Spartan phalanx after a Greek man called Ephialtes betrayed his country by telling the Persians of another pass around the mountains. At Artemisium, large storms had destroyed ships from the Greek side and so the battle stopped prematurely as the Greeks received news of the defeat at Thermopylae and retreated. After Thermopylae, Athens was captured. Most of the Athenians had abandoned the city and fled to the island of Salamis before Xerxes arrived. A small group attempted to defend the Athenian Acropolis, but they were defeated. Xerxes burnt the city; leaving an archaeologically attested destruction layer, known as the Perserschutt. The Persians thus gained control of all of mainland Greece to the north of the Isthmus of Corinth. After the military blunders in Greece, Xerxes returned to Persia and oversaw the completion of the many construction projects left unfinished by his father at Susa and Persepolis. He oversaw the building of the Gate of All Nations and the Hall of a Hundred Columns at Persepolis, which are the largest and most imposing structures of the palace. He oversaw the completion of the Apadana, the Palace of Darius and the Treasury, all started by Darius, as well as having his own palace built which was twice the size of his father's. His taste in architecture was similar to that of Darius, though on an even more gigantic scale. He also maintained the Royal Road built by his father and completed the Susa Gate and built a palace at Susa. Later generations' fascination with ancient Sparta, and particularly the Battle of Thermopylae, has led to Xerxes' portrayal in works of popular culture, although more often than not in a negative light, often portraying him as ranging from unsympathetic to megalomaniacal. This can be blamed largely on the fact that most sources from the period are of Greek origin. The authors of these sources generally demonize Xerxes in a manner that is reflected in more modern works. For instance, he was played by David Farrar in the fictional film The 300 Spartans (1962), where he is portrayed as a cruel, power-crazed despot and an inept commander. He also features prominently in the graphic novel 300 by Frank Miller, as well as the film adaptation 300 (2007) and its sequel 300: Rise of an Empire (2014), as portrayed by Brazilian actor Rodrigo Santoro, in which he is represented as a giant man with androgynous qualities, who claims to be a god-king. This portrayal has attracted controversy, especially in Iran. Ken Davitian plays Xerxes in Meet the Spartans, a parody of the first 300 movie replete with sophomoric humour and deliberate anachronisms. ↑ "XERXES i. The Name – Encyclopaedia Iranica". Iranicaonline.org. 2011-09-30. Retrieved 2014-07-25. ↑ Encyclopaedia perthensis, or, Universal dictionary of the arts, sciences, literature, etc. : intended to supersede the use of other books of reference. Google Books. 1816. Retrieved 2014-07-25. ↑ Law, George (2010-06-04). Identification of Darius the Mede. Google Books. ISBN 9780982763100. Retrieved 2014-07-25. ↑ Lazenby, J.F. (1993). The Defence of Greece, 490-479 B.C. Aris & Phillips. ISBN 9780856685910. Retrieved 2016-09-07. ↑ M. Boyce, Achaemenid Religion in Encyclopædia Iranica. See also Boardman, J.; et al. (1988). The Cambridge Ancient History Vol. IV (2 ed.). Cambridge University Press. ISBN 0-521-22804-2. p. 101. ↑ "Bêl-šimânni and Šamaš-eriba - Livius". livius.org. Retrieved 2016-09-07. ↑ Boucher, Geoff "Frank Miller returns to the '300' battlefield with 'Xerxes': 'I make no apologies whatsoever'", The Los Angeles Times, June 01, 2010, accessed 2010-05-14. Shabani, Reza (2007). 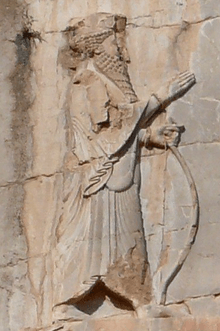 Khshayarsha (Xerxes). What do I know about Iran? No. 75 (in Persian). Cultural Research Burreau. p. 120. ISBN 964-379-109-2. Boardman, John; al., et (1988). The Cambridge Ancient History. V. Cambridge University Press. ISBN 0-521-22804-2. "Xerxes". Encyclopædia Britannica (11th ed.). 1911.